Canadian inflation unexpectedly accelerated on a surge in airfares last month, but underlying price pressures remained steady. The consumer price index in December recorded a 2 per cent gain from a year ago, up from 1.7 per cent in November, driven by a 22 per cent surge last month in the cost of air transportation. Economists had been expected inflation to be unchanged at 1.7 per cent. Core measures of inflation -- seen as a better gauge of pressures -- were unchanged at about 1.9 per cent. Inflation in the services sector hit 3.5 per cent in December, the highest since August 2008. Excluding gasoline, consumer price inflation hit 2.5 per cent, the fastest since 2014. Still, policy makers tend to look more closely at the core figures and those have stayed steady at near 2 per cent for more than a year. Statistics Canada also said to treat the jump in air transportation costs with caution after a change in how it’s calculated. A core rate at near 2 per cent is consistent with an economy at full capacity -- but not one that is overheating. 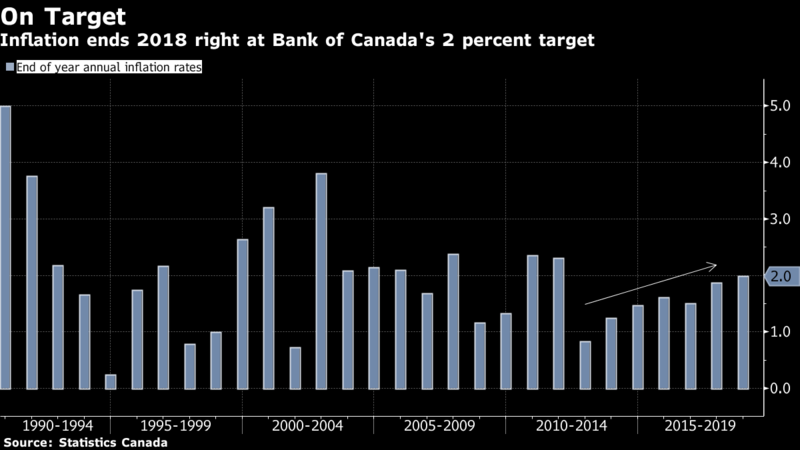 This gives the Bank of Canada scope to proceed with caution on further interest-rate increases, as it has been indicating. Inflation in the fourth quarter averaged 2 per cent, in line with the Bank of Canada’s latest projections released last week. The central bank forecasts inflation will average 1.7 per cent in the first quarter and slow further by the middle part of the year before accelerating back to 2 per cent by the end of 2019. Overall, 2018 saw inflation finish above the central bank’s target for the first time in seven years -- averaging 2.3 per cent last year from 1.6 per cent in 2017. Gasoline prices continued to be the largest downward driver to inflation, falling 6.5 per cent on the month.